Eva, a robotic arm developed by U.K. start-up Automata Technologies, is perched on a table near a laptop. Tucked away in a small converted warehouse in London is the office of Automata, a British start-up working on a machine it thinks might shake up the industrial robotics space. Automata makes a tabletop robot arm called Eva. 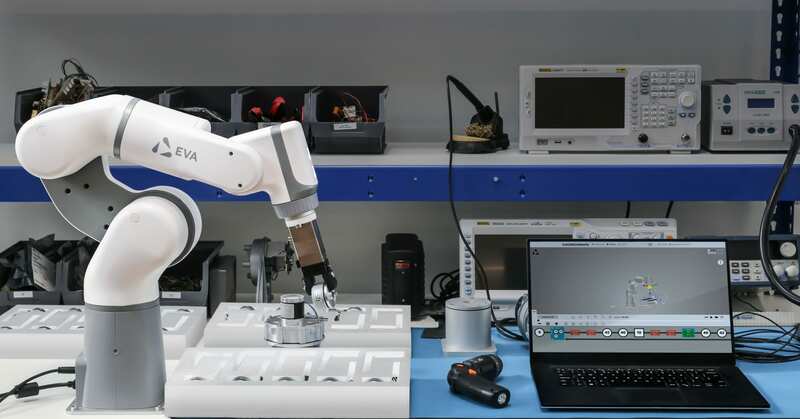 With a £4,990 ($6,600) price tag, the machine is designed to be a more compact and affordable alternative to the larger robots that help manufacture everything from cars to phones but typically cost tens of thousands of dollars. That was one thing that led Swiss engineering giant ABB to invest in the company early on, co-founder Suryansh Chandra told CNBC in an interview. The firm contributed to Automata’s seed funding, and more recently backed a $7.4 million investment in the company. “We were still a two-people company with a prototype we could carry around in our backpack, which was insane for ABB because their robots weigh 50 kilos,” Chandra said. Stepping foot in Automata’s offices, a group of its machines can be seen perched around a table. They’re communicating with each other, picking up empty cans, using a camera to check whether they have the right lid — one lid has a black mark to show it’s faulty — and then sending them along a conveyor belt to decide which can passes and which fails. The display is just one demonstration of Eva in action. Chandra shows a video of the robotic arm lifting a large metal sheet to take it from one spot in a factory to another. This is a job that was previously filled by a female worker in her 20s, fellow co-founder Mostafa ElSayed said. That staffer hasn’t been made redundant, however. She now programs the robot herself, and “gets to think about how to roll it out in the rest of the factory,” ElSayed said.